One pattern has established itself throughout the Men's Doubles competition at the 2016 Czech Open, and that is Korea Republic being the dominant force across the event. 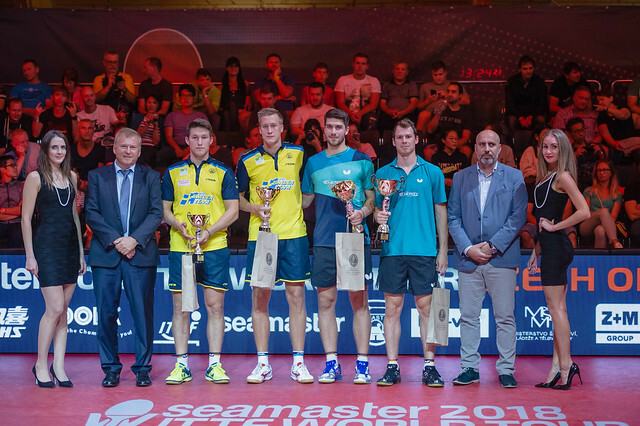 Filling out three of the four semi-finals spots followed by taking both positions in the final, the country's players will be satisfied with their showing in Olomouc. Cho Eonrae (30) and Park Jeongwoo (19) faced Kim Minhyeok and Park Ganghyeon (both 20) in an all-Korean final, guaranteeing title number 32 for their country in the Men’s Doubles category. The success is a nice change for Korea Republic, following on from their disappointing campaign at Rio 2016. The 2016 Games in Rio was the first time that Korea Republic failed to win an Olympic Table Tennis medal of any colour, and the scrutiny of the national setup has begun. But with the title assured at the Czech Open there will finally be something to smile about for the Korean Table Tennis contingent. Cho and Park Jeongwoo made the better start to the final and they built upon their advantage in game two, establishing a commanding 2-0 lead in the best of five games encounter. However, the third end provided more of a contest than the previous two games combined, as Kim and Park Ganghyeon found improvement in their play. Deuce arrived and moving two points clear was the objective for both sides; six further points were played out before Cho and Park Jeongwoo finished off the match (11-8, 11-6, 14-12) to win their maiden World Tour Men’s Doubles crown as a partnership. The victory signalled Men’s Doubles title number four for Cho Eonrae having secured the Brazil Open (2007) along with the 2007 and 2014 Qatar Opens, but Olomouc was the first occasion where Cho and Park had won the trophy together. With an age gap of 11 years, the master and the apprentice combination of Cho and Park shows great potential for the country moving forward: will Cho’s guidance help to further Park’s game? Only time will tell. Next up for the ITTF World Tour is the 2016 Belarus Open; will Cho and Park partner up once again and make it back-to-back Men’s Doubles titles? Don’t rule out the possibility of another triumph for the Korean duo sometime in the not too distant future.